Proline is one of the α-amino acids that are used by living organisms as the building blocks of proteins. The L-isomer of proline, which is the only form that is involved in protein synthesis, is one of the 20 standard amino acids common in animal proteins and required for normal functioning in humans. Proline is unique among these in that the nitrogen atom is part of the ring structure, the cyclic array of carbon atoms, rather than outside the ring. That is, its amino group, through which it links to the other amino acids, is a secondary amine, rather than a primary amine group (−NH2), as in the other nineteen amino acids. Proline is not classified as an "essential amino acid" since it does not have to be taken in with the diet, but can be synthesized by the human body from other compounds through chemical reactions, notably from glutamic acid. The unique structure of proline, with the amino group part of the ring structure, is important for the shape of proteins. The functionality of a protein is dependent upon its ability to fold into a precise three-dimensional shape. Proline's linkage to other amino acids through the amino group contributes to various bends and kinks in the shape of the protein, without which the protein could not function properly. This reflects an extraordinary complexity and harmony. Somehow, proteins made up of hundreds of amino acids are able to configure themselves into the correct shape, and then carry out vital functions. 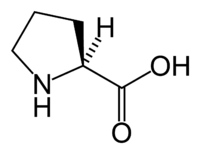 Proline's three letter code is Pro, its one letter code is P, its codons are CCU, CCC, CCA, and CCG, and its systematic name is pyrrolidine-2-carboxylic acid (IUPAC-IUB 1983). where R represents a side chain specific to each amino acid. Proline is the exception to this basic structure since its side chain cyclizes onto the backbone, forming a ring structure in which a secondary amino group replaces the primary amino group. Proline is unique among the 20 standard amino acids in that the amino group is part of the cyclical ring of atoms. The other nineteen amino acids are all primary amino acids, with the amino group not part of the circle-like array of atoms. However, due to the cyclic binding of the three-carbon side chain to the nitrogen of the backbone, proline lacks a primary amine group (−NH2). The nitrogen in proline is properly referred to as a secondary amine. This configuration offers important properties to proteins since it is the amino group (and the carboxyl, -COOH) that links one amino acid to the other. (A peptide bond is a chemical bond formed between two molecules when the carboxyl group of one molecule reacts with the amino group of the other molecule.) This unique aspect of proline is important in establishing the structure of the protein, contributing to various bends and kinks in the shape of the protein. For a protein to function, its must have a particular conformational shape. Proline is sometimes called an amino acid, although the International Union of Pure and Applied Chemistry (IUPAC) definition of an amine requires a carbon-nitrogen double bond. In biological terminology, however, the category "amino acids" is generally taken to include proline. Most amino acids occur in two possible optical isomers, called D and L. The L amino acids represent the vast majority of amino acids found in proteins. They are called proteinogenic amino acids. As the name "proteinogenic" (literally, protein building) suggests, these amino acid are encoded by the standard genetic code and participate in the process of protein synthesis. In proline, only the L-stereoisomer is involved in synthesis of mammalian proteins. Proline has the chemical formula HO2CCH(NH[CH2)3, or more generally, C5H9NO2. The distinctive cyclic structure of proline's side chain locks its backbone dihedral angle at approximately -75°, giving proline an exceptional conformational rigidity compared to other amino acids. Hence, proline loses less conformational entropy upon folding, which may account for its higher prevalence in the proteins of thermophilic organisms. Proline acts as a structural disruptor in the middle of regular secondary structure elements such as alpha helices and beta sheets; however, proline is commonly found as the first residue (component) of an alpha helix and also in the edge strands of beta sheets. Proline is also commonly found in turns, which may account for the curious fact that proline is usually solvent-exposed, despite having a completely aliphatic side chain. Because proline lacks a hydrogen on the amide group, it cannot act as a hydrogen bond donor, only as a hydrogen bond acceptor. Multiple prolines and/or hydroxyprolines in a row can create a polyproline helix, the predominant secondary structure in collagen. The hydroxylation of proline by prolyl hydroxylase (or other additions of electron-withdrawing substituents such as fluorine) increases the conformational stability of collagen significantly. Hence, the hydroxylation of proline is a critical biochemical process for maintaining the connective tissue of higher organisms. Severe diseases such as scurvy can result from defects in this hydroxylation, e.g., mutations in the enzyme prolyl hydroxylase or lack of the necessary ascorbate (vitamin C) cofactor. Peptide bonds to proline and other N-substituted amino acids (such as sarcosine) are able to populate both the cis and trans isomers. Most peptide bonds prefer overwhelmingly to adopt the trans isomer (typically 99.9 percent under unstrained conditions), chiefly because the amide hydrogen (trans isomer) offers less steric repulsion to the preceding atom than does the following atom (cis isomer). By contrast, the cis and trans isomers of the X-Pro peptide bond are nearly isosteric (i.e., equally bad energetically); the (cis isomer) and atoms (trans isomer) of proline are roughly equivalent sterically. Hence, the fraction of X-Pro peptide bonds in the cis isomer under unstrained conditions ranges from ten to 40 percent; the fraction depends slightly on the preceding amino acid X, with aromatic residues favoring the cis isomer slightly. Cis-trans proline isomerization is a very slow process that can impede the progress of protein folding by trapping one or more prolines crucial for folding in the nonnative isomer, especially when the native isomer is the rarer cis. All organisms possess prolyl isomerase enzymes to catalyze this isomerization, and some bacteria have specialized prolyl isomerases associated with the ribosome. However, not all prolines are essential for folding, and protein folding may proceed at a normal rate despite having non-native isomers of many X-Pro peptide bonds. In addition to its vital role in the structure of proteins, proline is also used as a dietary supplement and in biochemical, microbiological, and nutritional research. Proline has a sweet flavor with a distinct aftertaste. Proline also causes slight irritation to the tongue like Sichuan Pepper. International Union of Pure and Applied Chemistry and International Union of Biochemistry and Molecular Biology (IUPAC-IUB) Joint Commission on Biochemical Nomenclature. 1983. Nomenclature and symbolism for amino acids and peptides: Recommendations on organic & biochemical nomenclature, symbols & terminology IUPAC-IUB. Retrieved August 30, 2007.